​The DC Comics duo Hawk and Dove have enjoyed quite a resurgence of late, propelling out of Blackest Night into Brightest Day and finally their own series in the DCnU. They've also finally come out of the toy wilderness, with 6" action figures from both DC Direct and Mattel, and their first foray into the statue world with these mini-busts from DC Direct. 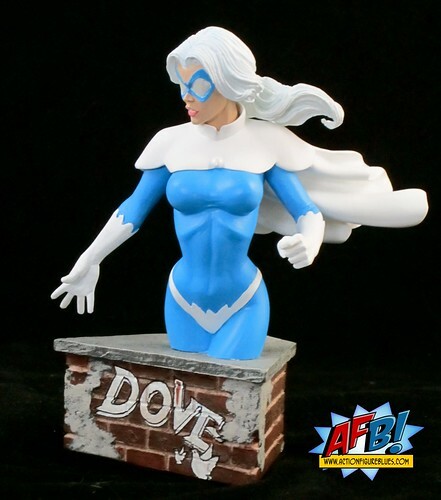 While the original Dove, Don Hall, has yet to be produced in any of these forms, his successor, Dawn Grainger, has certainly found her place in the collectables spotlight! While you'd be forgiven for thinking these busts are a boxed set, they are actually from separate mini-bust lines. 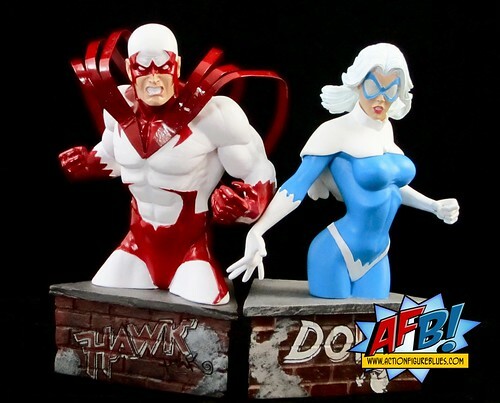 Hawk comes from the Heroes of DC Universe Mini-Bust line, while Dove comes from the Women of the DC Universe Mini-Bust line. They are sold separately, but have clearly been designed by Amanda Conner and sculpted by the very talented Karen Palinko to be a matched set. 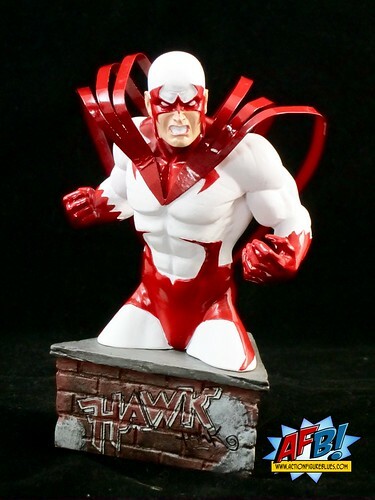 While the 6" versions of Hawk haven't been compete home runs, this bust captures the character perfectly. Some of this has to be put down to the facial expression - the Avatar of War really needs to be getting his rage on, after all, and that's harder to pull off successfully on an action figure than it is on a statue. Conner and Palinko have produced a real winner here. I do think that a full size statue would afford a more natural aggressive arm pose, but for a mini-bust this works just fine. I do like the fact that instead of two closed fists, Hawk's left hand is open to show the talons at the end of his fingers. Hawk's costumed red wings, which are long strips of red, must have posed quite a design consideration for this piece, but DCD has come up with an excellent solution. 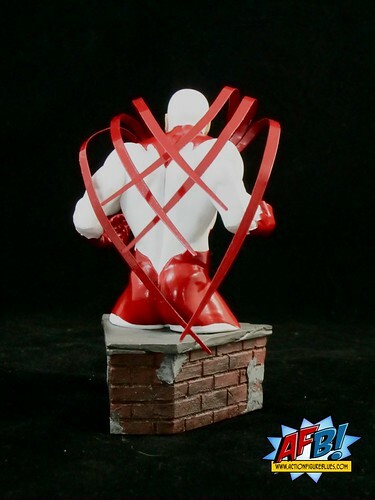 Instead of including these in the sculpt, which most certainly would have lead to breakages and collector tears, a flexible metal solution has been used, and in fact is shared by the DCD Hawk figure from the Brightest Day series, which I'll be reviewing shortly. This is a great idea for the bust not only for preventing breakages, but also because it allows the collector flexibility to decide how the wings are displayed, which may in part depend on the space available. I wasn't quite able to achieve the exact bend and pose that was shown in the pictures on the bust's packaging, but I was happy with the options I came up with. It's a smart and clever design choice. 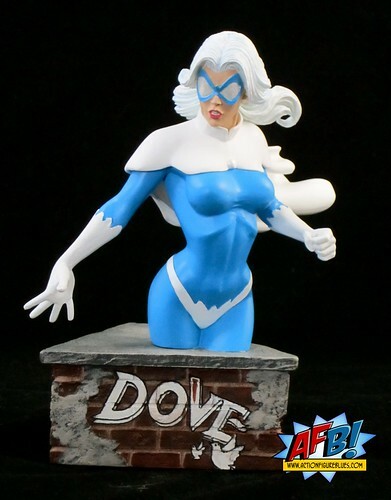 The 6" efforts with Dove have been more effective at capturing her look than the Hawk figures, but this bust is still a considerable step up in capturing not just Dawn's costume and appearance, but the nature of her as a character. The pose accomplishes this and also delivers a great deal of energy. Palinko's skill as a sculptor really comes through in this piece: you can tell she has a great grasp of human anatomy when you look at the structure of the figure. 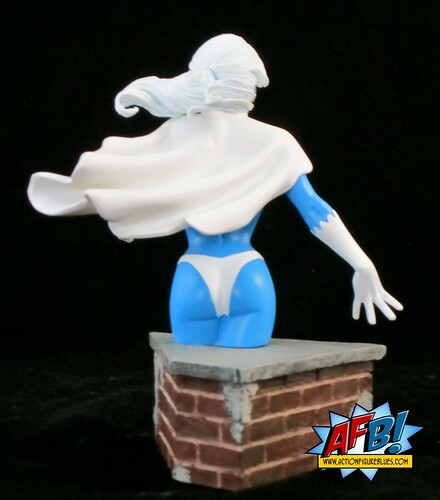 This might seem to be a simple sculpt, but there is a pleasing amount of detail present, especially in Dove's hair and cape at the back. I'm providing rear or side shots of both busts so that you can appreciate the detail. Palinko is a great talent and I do hope that DCD continues to put her talents to good use. 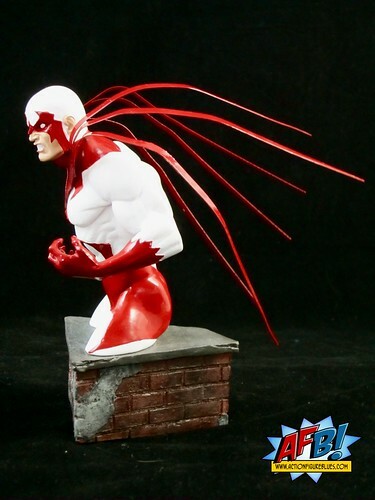 The bases of these are a rather inspired nod back to the origins of the original Hawk and Dove. These characters were born out of a time when "peace" was a word and and idea that was becoming a catch cry for the youth of the West, and represented the opposite sides of the argument that was gripping the world at that time. It's very fitting, then, that the busts sit atop brick walls with the character's names spray-painted in a '60s style graffiti. It works especially well when the busts are positioned next to each other. A great touch! While the overall effect of the paint work on these pieces is excellent, especially considering that each character has white as a predominant colour, there is a tiny bit of paint bleed on each bust, both around the belt and hip region. I doubt I'd notice it on either bust if I wasn't expecting them closely for review, but it's worth noting. DCD statues and busts are usually pretty spotless in the paint department, but there have been a few paint bleed issues of late. Let's hope it's not a trend. Happily, the issues here really are very minor and don't hinder the enjoyment of the pieces at all. 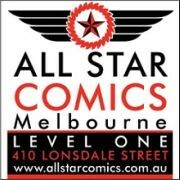 I fear we may have seen the last of this style of product from DCD, as it appears the company will be focusing solely on the DCnU from this point out. These two bust lines have given us a wide range of characters to enjoy and display, and I do hope that DCD finds a way to continue to bring us the slightly more unusual character selections that these lines, in particular the Women of the DCU line, have afforded us. If we have reached the end point of these lines, these are excellent pieces to go out on. You can see a greater range of pics of these items at Facebook, discuss these at the AFB Forum, and comment here at the blog to enter the January AFB Comment of the Month Contest! Nice pair. Hawk looks good too (zing!!). These are extremely well done just due to how they capture there emotions that these characters are know for. I miss Don. Sometimes I feel like the powers that be thought that his pacifist stance was too effeminate somehow. Which is a shame. I'm quite tempted by their upcoming DCUC figures, though. One question: as a bust-newbie, I got to ask: what's the deal with most busts cutting off just below the knee? Technically bust is mid-torso up, so why not make these full-length?